Tempura Sushi, Sweet Potato Fries, and the clinging of cocktail glasses weren’t the only sounds at Yoshi’s in Oakland on a Friday night. 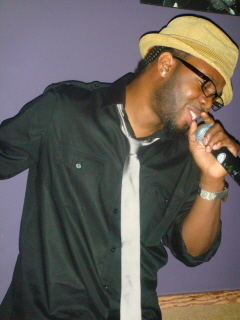 R&B artist, Dwele opened the beautiful summer weekend with two shows on Friday night, July 9th, in the Jazz Club. With the timeless sounds of his new album and snippets of his old discography, Couple, friends, and families gathered near the stage to experience his live band and vocals. I felt the anticipation as the light dimmed and the announcer introduced him to the stage. Dwele immediately came in, basked in his standing ovation, and grabbed the mic with his neatly shaven goatee, and his laidback Detroit demeanor. The band responded be playing an all time favorite “flapjacks” with the help of the audience. Ladies snapped their fingers and the fellas were groovin’ as he went through a few selected songs like “I Wish”, “and a small breakdown from his current album “W.ants W.orld W.omen”. He introduced the band like any artist but what was so special was Oakland’s own KevChoice was on the keys, a very popular hip-hop pianist that makes appearances in the Oakland nightlife scene. Dwele became very interactive and strolled through the crowd to “What’s not to Love”, and “How I deal”. By showing gracious love, he conducted a tribute to Oakland with the background singers “Oaktown” over the instrumental to Usher’s “There Goes My Baby”. Although his selections seemed very new to the audience the show ended abruptly and he exited the stage right in the mist of our excitement. I was almost upset and joined into the demanding of an encore. He finally came out and thanked Oaktown with a song that definitely sealed the night. Whether it was a short evening or one of the first shows of his tour weekend, you would truly have to be a true Dwele fan to understand the experience at Yoshi’s.